In previous issues of WendyZworlD, I wrote a bit about my 25+ year search for my family's history. I have been asked by many of my readers to give a quick 'How-To' to find your own relatives (and thereby lay the foundation for a pro genealogist to dig deeper for you in your target country). 1) Locate your ancestral village. For some that's as easy as asking your grandparents or parents where they came from. For others (like me) it is more difficult and you will have to do a regular genealogical search. This really is great fun, sort of a time machine feeling, but progress is measured in geological terms. For those of you searching your roots in the Czech or Slovak Republics, the Czechoslovak Genealogical Society has several very good books for sale dealing with Czech and Slovak genealogy to help get you started. Write the CGSI directly for their book list (cgsi.org). Note: When you ask your folks where they are from, get as much detailed information as possible. Not only the town/city, but the county or state, and house address too if you can. My grandfather told me his parents were from Pilsen, but when I personally researched the Pilsen archives, (thank god I speak German) the family was not to be found. Had I had the address, or county name, I could have broadened my search. For my great grandfather I only until just a short time ago knew his birth village (which is really nowhere NEAR Pilsen). I did also eventually find my great grandmother too (and 5 more generations after!) in a town about 50 miles away listed in a different archive altogether! Weave together as much of this oral history as possible and repeat back to the people you're interviewing, the story as you've understood it so far. If they have trouble remembering the year, ask how old they were at the time of the event they are recalling, or even describe what they were wearing. This is really a very good technique (age minus birth year, or a little research in a fashion history book, you get the point). The oral history will be the framework for your research, which you will then back-up with actual documentation. Remember, memories may be precious but official documents are more accurate (but not always). Again, you will have to find EXACTLY where your relatives are from. Many small towns have been absorbed by nearby towns but still keep their own records. 2) Do a reverse search. If you don't have a lead on living relatives, but have narrowed down your ancestral area send a letter describing the situation of your ancestor's emigration (and any other useful info) to every person with the surname you are searching in the town or area you're searching in (this is cheaper than you'd think). If possible write the letters in the language of the land. Many genealogy societies dedicated to one particular ethnic group quite often obtain local phone books for just such research. 3) Search the directories of universities in your ancestral area on the internet. By doing so, you might come up with a surname match (I did, and though we are still not sure we are related, he was very helpful). Even though you may not be related, you might make a new friend. This person might offer send you scans of their local phone book with the surnames you are looking for if they get into your adventure too. Go through the doc-list below, and/or pick-up one of the "Getting Started" books through the CGSI (for Czech and Slovak research), or your local bookstore. If you have exhausted all other sources and are still having problems locating your ancestral village, you may want to consider joining a local genealogical society. There may be some new sources that other members found to help their obstructed research. The key is to not give up. Just when you get the feeling your relatives BEAMED to the U.S., you'll find another clue. Another helpful tip is to do a surname posting at any of a number of genealogy interest group websites, or on Ancestry.com. You must give as much info as you can, unless you like a lot of fruitless but well meaning e-mail. 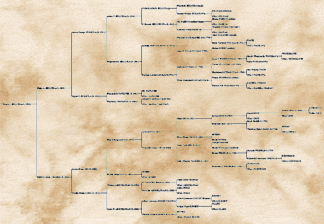 Using general postings, I found one branch of my research families descended from the brother of his gr. gr. gr. gr. gr. grandfather (+ or - one gr.). Then worked forward to find the branch that still lives on the farm where a good number of them are buried. Wow! Also, keep-up with what's going on today in the countries you're researching. Events that are happening today may effect your access to information tomorrow. With a little forewarning, you can push through info requests, say, before a coup, a velvet divorce, or a civil servants strike. Ships Records are available through the National Archives in Washington D.C., but you will need exact year and port of entry or it gets very expensive if they bother at all. If you can get this it will also list who your ancestor immigrated with, revealing otherwise unknown siblings. There are directories of these records you can scour by year and name, at many historical societies in large cities, or now online. Note: The Declaration of Intent, Certificate of Naturalization, death and birth certificates, and Census data will all either give date of immigration or "Years in the U.S." which, with a little math (year of document minus years in U.S = year of immigration) is just as good. Update from Wj: I have been using Ancestry.com for the past few years for research and managing and sharing my family information. They have a TON of great resources that can help you find where your first-generation immigrants to the U.S. came from, and it's easier than ever before to make that connection. As you dig deeper though, unless you can read the old script plus Czech, Latin and German, you'll find the assistance of a trained researcher invaluable for unraveling the complexities of conflicting records and "close but not quite" names (Example: It was very common to keep naming subsequent babies the same name until one managed to survive, or, for siblings and cousins in the same village [or house!] to name their children also after the same ancestors). Once you make that genuine connection, having the services of a multi-lingual guide to not only help you find your genuine home-villages, but currently living relatives there, and then join you on your homeland journey to act as translator, makes for an experience you will cherish for the rest of your life. Not to mention, a new connection to your roots family you can share with your children, and their children. My hot tip for Czech research, Dr. Mirosav Koudelka of course!